Ventriloquism is an entertainment art that reaches back hundreds of thousands of years. The first puppet may have been a dead animal that a caveman jammed his hand into and pretended was alive, but ventriloquism is a sophisticated artform that couldn’t have been invented until after early man developed religion, monotheism, and ultimately Satan. There needed to have first been shamans and then witch doctors and then witches who created poppets and voodoo dolls and then wooden dummies that had articulated jaws. As with anything so saturated in Evil, fanatics realized that they could pour their actual souls into these little bodies, giving them life and personalities. Ventriloquism was developed by perfecting the act of speaking for this un-alive but not inanimate person without moving their own mouths. Traveling shows of the 1800s featured their talents and Vaudeville took it from there. Ventriloquists thought that audiences were entertained by acts well done, and not actually compelled to watch these disturbing human disasters working out their deep, deep mental problems peppered with self-insults and puns about wood, as the magical doll stared out with sightless eyes, being far more self-aware than the human who was the second fiddle, the underling, the parasitic twin that grew, vestigial, from out of the back of the star, and the dummy is undeniably the star of the show. Witty, urbane or a dimwitted clod, I guess, the dummy has all the best lines and constantly shames and embarrasses its human handler. Or at least that’s the stereotype I cling to and there are probably a thousand acts that aren’t anything like that, but to be quite honest with you, I am made uncomfortable by that kind of puppetry, so I am not going to find out for sure. But the dummies! They are fascinating. 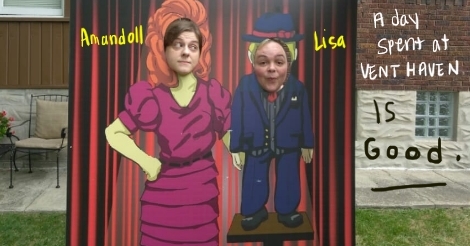 I aspire to one day make one of my own, a little me like on every good long-running sitcom or cartoon. I need a Lil’ Manda Knucklehead. 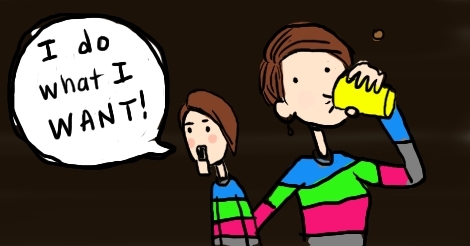 I want to berate myself and laugh-cry, performing to no one. At the very least, a comic of my routine is forthcoming in case I can’t master the presumably difficult highly skilled craft of dummy-making. Back in July, I had an uncommonly good day because I finally got to go to a Vent Haven Open House. 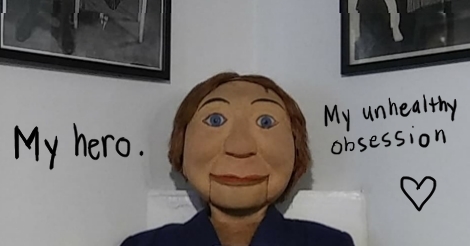 As it turns out, the only ventriloquism museum in the world is located about four miles from Sneer Headquarters and we didn’t even know that until after we obtained the house! What good fortune we have. There are over eight hundred dummies housed within walking distance from where the two dummies who write these articles for you are housed, ah hyuck. Normally, you have to brave the telephone in order to call up the on-site caretakers for a personal tour of the premises, but a few times a year, they host open houses free for the public. All of the people involved are wonderful, lovely people. The caretakers are charming and charismatic. Actual ventriloquists are around, making a good impression on those of us who consider it to be a worrying hobby or a disconcerting lifestyle. Like any good cult, they let you see the appeal and sometimes, later, when you are alone and confused, you might think about getting in closer. Seeing what it’s all about. Is it like clowning? Is there an allure that involves a dark power? Well I will tell you as soon as I try it out! 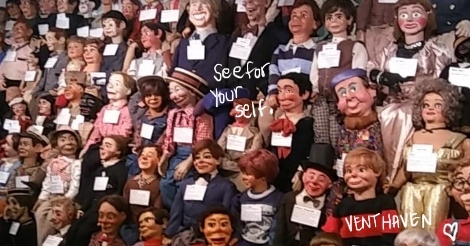 I keep mentioning that it is the artistry of the dummies that appeals to me, but I really have to make a separate paragraph to say that meeting ventriloquists opened my eyes to a new interest. Because of horror television, I had cast the ventriloquists themselves into a pile marked “avoid.” But I now think that I had them all wrong. Maybe I developed a quick form of Stockholm Syndrome, or maybe they wove a spell on me, but they were all so sincerely and pleasantly enthusiastic about this craft. Perhaps I had been unfair, along with most of the rest of the world. Maybe they are like Real Clowns, who don’t seem to realize that people around them are disturbed by their presence. I think that’s sweet. I am now in favor of the ventriloquists. Anyway, the grounds have three buildings filled to the brim with dummies from the present and the distressing past. Also, there is a very nice house that contains the caretakers and their things. There were so many dummies to see that it is very overwhelming and you cease to be able to take in specific details. But they are there, looking at you with their eyes, seeming like they could start moving at any moment, because you definitely feel like the Twilight Zone is real, and that is the kind of thing that would happen. Each specimen has a little informational plaque that tells you of its personal history, who its partner was, when it was actively working, all of that sort of thing. There is a book for sale about the man who founded the museum, and I think if I get a spare moment, I will be as interested in him as I am in these dummies, because he wasn’t a ventriloquist — he just liked the dummies, too! I would like to show you all of the two zillion pictures that I took, but there was a cautionary sign about spreading around photos without permission. I don’t want to risk being cursed here. However, I wanted to let you know the most exciting anecdote to arise from all of this. Like ten years ago on the internet when vapid list articles started being around, many people sent me ones that were about turn of last century’s ventriloquists because it showed a lot of creepy photos. There was one I was obsessed with, Frank Byron, Jr. Well… Just guess who is there, sitting in a building four miles away from me. I felt like I was meeting a huge celebrity. Such a perplexing thrill and highlight of the summer, perhaps all of 2018. I’m going to have to go back next year because there is a shirt that they sell to raise funds that I want to get, but I didn’t have enough cash last time. I hope they don’t consider this article to be offensive; I would hate to go there only to find a little dummy on display that looks like me. I mean, unless it is the one that I make and fill with my soul and bequeath to them after my demise. That is my Newest Dream. 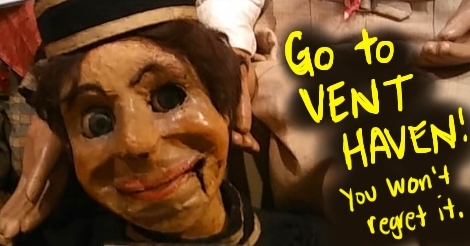 Meanwhile, you really should take a trip to the Vent Haven Museum, or just go to their site and adopt a dummy, or simply shove all your charitable money at them so that they can keep this beautiful place going forevermore. And Vent Haven, please don’t tear our site down because I didn’t protect the dummies’ identities with censor bars like I normally do.